Note: A storm is forecast for Monday night through at least Tuesday night. Please call (703-360-4600) before venturing out to make sure we’re open. Please be safe!!! Greetings, all! I have a confession: I should have posted these photos yesterday, but I got sucked in to a New-From-Nashville Project that I brought home from the shop on Market Night (shhhh, I spent the day stitching instead of housecleaning and posting photos). Taken under lamplight, so it’s showing a little paler than in real life. The two magic words for today are “luscious silks” (no, not “chocolate brownies” even if we do have a snowstorm coming). Here’s the project: Lindsay Lane Designs “Betsy Croome 1789.” Flowery, Easter colors, and banish the winter blues. And look at this: Queenstown Sampler Designs’ “German Saxon 1737.” My photo doesn’t do it justice really. The colors are lovely, and the dresses on these women are so fun and colorful. Also QSD: “Mary Ann Pearson 1838.” Love those birds and the very different basket and the fabulous border. I’m going to have to get this. “Phebe Nichols 1824.” I love the funky border, the pot and the spotty tulips. “Ann Jordan c. 1841,” one of a pair (I need to find her sister photo and will show you that another time). “Funky Blue Crab” also by Samplers Revisited. May we suggest a piece of jewelry/needle minder for your Funky Blue Crab? Also from Samplers Revisited, “Jane McNair Ketching 1862.” I will need to pick this up as well–I so love the Scottish samplers. Last but not least, Samplers Revisited’s Santa Visitors. This particular one is the Delaware Santa; he is holding a blue hen. There are lots of additional Santas/locations. “Sew Sisters” from Plum Street Samplers. “Smith Sampler” by Scarlett House. This chart has flown out the door–we have already restocked! 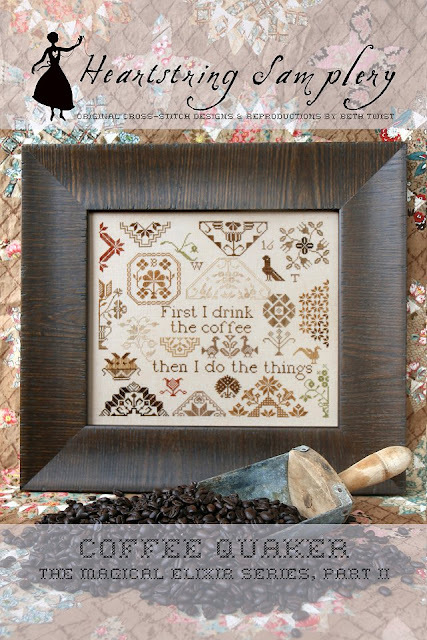 The hilarious and clever “Coffee Quaker.” I want to stitch this, and I don’t even drink coffee. 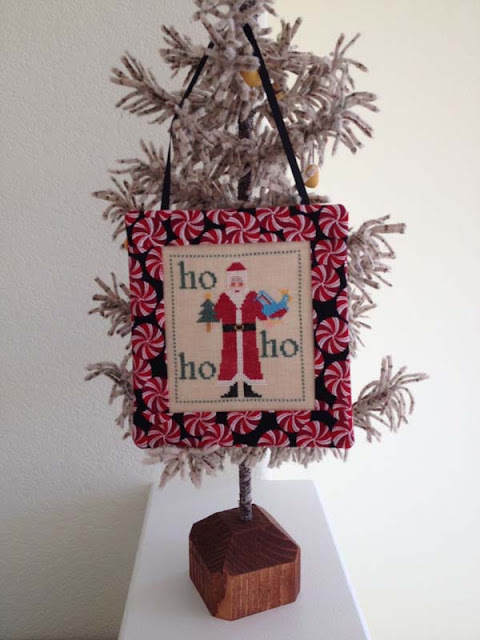 I have lots more cross stitch, fabrics and fibers to share in the coming days, so please stay tuned, or if you can, drop by and see us and see the needlework show which continues at Woodlawn Plantation (every day but Tuesdays through the month of March). We will be open 10-5 Monday through Saturday and 12:30-4:30 each Sunday during March. Stitch night resumes normal schedule (1st and 3rd Wednesdays of the week, from 5-8 p.m.) this Wednesday, March 15. Come join us!